God’s cultural sense of humour. I took this picture on the 1,865-metre ascend up to the top of Huangshan in Anhui Province, China. The interesting thing is, as we observe the yellow rocks (hence the namesake), you will, in your mind’s eye, conclude that these rocks just had to be from China; I guess this could be because hand-painted portraits we are see from time to time physically depict Chinese mountains in this particular physical appearance and hence we naturally match such landscapes to oh-this-has-got-to-be-from-China. I wonder if this particular rock formation was there from the start (not likely), eroded into this state (more likely), or man-made (unlikely – you’d have to be REALLY bored to accomplish this). Either way, I reckon that God doesn’t just have a sense of humour, but a sense of cultural humour; it’s like He knew what would have tickled the Chinese bones. 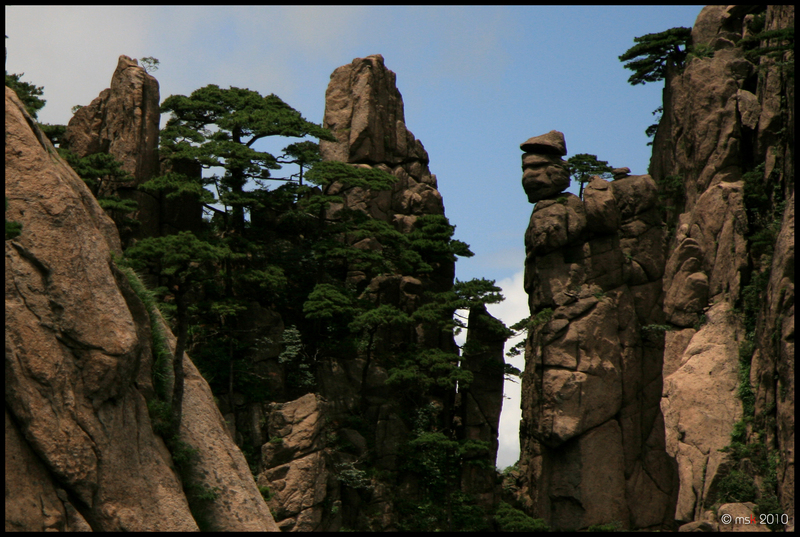 Well, it could have been a Westerner in a tuxedo, an African in a loincloth or a Japanese in a kimono… But no, this rock formation just had to be a Chinese farmer wearing a straw carrying a straw basket with a wooden stick picking herbs! It doesn’t get any more humourous than that. I’m inclined to believe that God really understand us. And the Chinese would simply say, “哈哈哈”. Posted on March 25, 2010, in A Walk To Remember, Extraordinary Mundane, Picture Perfect, Simple Pleasures and tagged Anhui, China, Cindy Hong, God, Huangshan, humour, Kay Park, Lee Huiyi, majestic, mountain, rock. Bookmark the permalink. 2 Comments. HAHAH i see it. =) oh btw i have internet now!